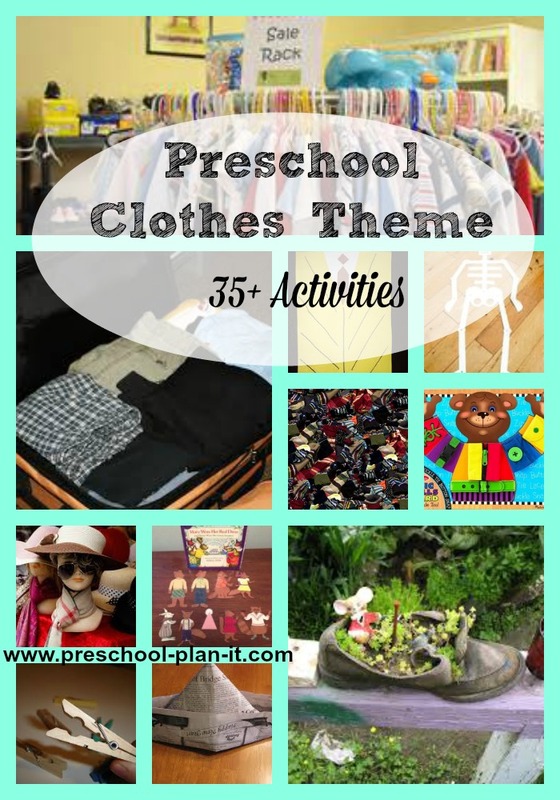 A Preschool Clothes Theme is a fun theme that draws your children into learning. It focuses on what they do everyday: Get dressed! Materials needed: 1/2 gallon cardboard milk or juice cartons, glue, scissors, miscellaneous arts and crafts supplies. You could have each child make a pair (if you can collect this many) or have each child make one shoe and when they are dry, place them in your dramatic play center for them to wear! Cut open a hold in the long side of the carton large enough for a child to fit their foot in. The children cut out any articles of clothing they find in magazines and glue onto a large poster board. Hang this for them to see throughout the week. Help children decorate paper bags to make shirts, skirts and jackets! (Cut armholes out in advance). Have children decorate by coloring with markers. Trace each child on large butcher paper. Have them add their facial feathers, hair, etc. And, give them markers, crayons or paint to paint their clothing on! Cover blocks in different textures of fabric. Add wooden thread spools for building as well! Act out each item of clothing you sing about! This is the way we get dressed in the morning, dressed in the morning, dressed in the morning. This is the way we put on our shirt, put on our shirt, put on our shirt. Other ideas: put on our socks, put on our shoes, put on our coat. Stand up in front of children. Have them describe what you are wearing. Then, wrap yourself in a blanket and have them recall what you are wearing! Let each child take a turn doing this as well! This is a version of I-Spy. You will by "spying" children in circle (this is a great name recognition game as well!). I spy with my little eye, someone who is wearing brown sneakers and a red shirt. Have the children roll out some sugar cookie dough. 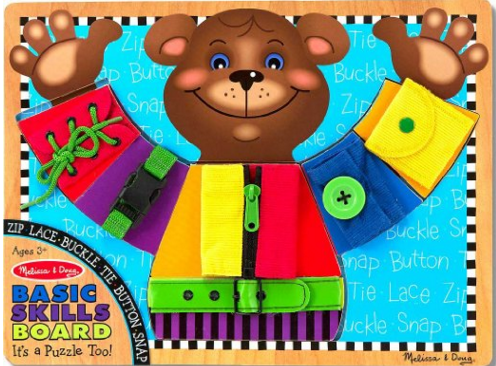 Using plastic knives or cookie cutters, they cut out shapes (clothing shapes). Bake. Provide frosting and fruit to decorate with when cooled. Make hats with the children for them to decorate in their hat shop! You will need: LOTS of newspaper, masking tape, glue and miscellaneous arts and crafts supplies to decorate with! Place double paged (you know, when 2 pages of the newspaper are still connected) on a childs head going from left to right. Now place a second double paged newspaper on their head going front to back. Have someone hold the paper firmly on their head. Using the roll of masking tape, tape around their head (over the paper) two times. Now, roll the edges up to the tape line and secure (by stapling). Now the children decorate and "sell" in their hat shop this week. Be sure to add bags for purchases, cash register and money and a table with supplies for the hat design center. 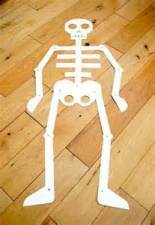 Find a paper doll template. Cut out and create several dolls. Trace and precut clothes (with tabs) out of paper. Provide these at the easel for the children to paint. When dry, provide the clothes and the dolls at your math and manipulatives center! 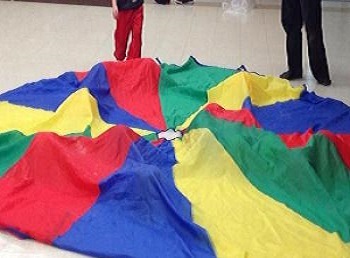 To Help Build Your Preschoolers' Muscles While They Have Fun Together! The children all take one shoe off. Place the shoes in a pile on the other side of the room. Send 3 children at a time to run to the pile, find any shoe that is NOT their, and come back to the group. They each state whose shoe they have and hand it to that person. Those children now go to the pile and do the same. Give the children long strips of fabric or crepe paper. They weave it throughout your fencing! Use different types of textures such as cotton, burlap, and wool. Add wide ribbon if you have it as well! Create or purchase a large dress up poster with clothes for the children to add onto the poster. The children can dress and re-dress it as they read stories about clothing this week. Click the link to the right to see what Amazon has! This Dress For The Weather Set is great to let children self-select the activity at center time! I made this from the book of the same name (see book list below). It is a great way for the children to "read", develop their fine motor skills and their seriation skills! Clothes Theme Activities to Help Your Preschoolers Develop Math Skills and the Small Muscles in Their Hands! In advance, prepare different clothing shapes out of heavy tag board. Hole punch holes around the edges for the children to lace using shoe laces. Find (or draw) pictures of clothing (you will need two of each). Glue the pictures onto index cards. Laminate. 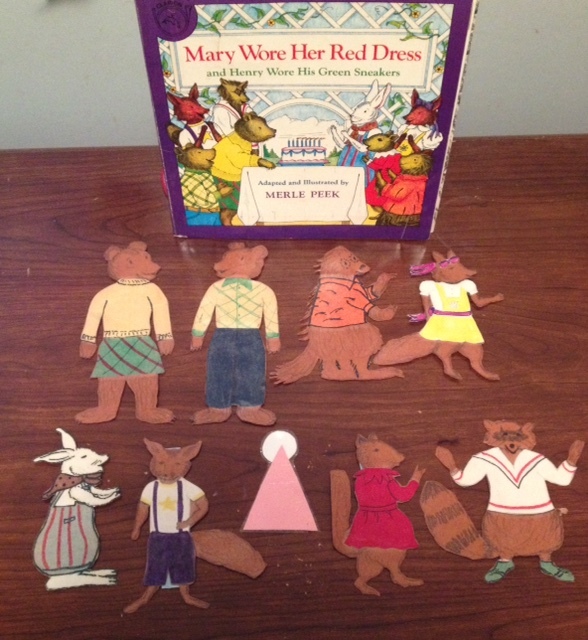 The children use them as a matching game or to sort by type of clothing. Find (or draw) and cut out clothing shape pictures (Color them if you draw them). Trace each shape onto black construction paper. Laminate the colored pictures. Glue the black (shadow) shapes onto a file folder. The children match the pieces of clothing to the shadow shape. Print numbers on clothespins with a marker. The children clip the clothespins onto a clothesline in the correct order. Provide a bin of socks. The children match them by color or by print. Teach them how to roll the pairs together or to how to fold them! Clothes Theme Music and Movement Activities and Ideas to get your Preschoolers Movin' and Groovin'! Hat, sweater, pants and shoes. Hat, sweater, pants, and shoes. And belt, and scarf, and underwear! Clothes Theme Activities for the Senses! Time to Do the Laundry! Provide either your baby doll clothing or other items of clothing and gentle dish detergent or baby shampoo to the water. The children will wash the clothes and then teach them how to wring them dry (great for developing large muscles!). Provide and area directly next to the table that has a wooden clothing horse to hang the clothes on. Be sure to have a mat under it for the water. You could alternatively provide a clothes line against a wall for the children to hang the clothes on. Create or purchase a board that has different textures of fabric: wool, satin, burlap, cotton, etc. Create or purchase a board that has different zippers, buttons, snaps, lace, etc. for the children to practice on. I found a few on Amazon. You can click the links below to see details or to check out others they may have available. Clothes Theme Science Activities--For Your Preschool Scientists in Training! Provide lots of white cotton or t-shirts. You will need items such as red cabbage, pomegranites, mustard, ketchup, frozen juice, tomatoes, etc. Use these to dye the cotton! Perhaps add bowls and spoons and paint brushes. I'd also suggest finding clear food service (non-latex) gloves to wear to avoid staining their hands. Writing Activity Ideas for Your Clothes Theme! Create 26 shirts and pants out of paper. The children match the letters. Miscellaneous Activity Ideas for Your Clothes Theme! Send a note home announcing Backwards Day! The children should wear items of clothing backwards such as their shirts backwards or inside out. Plan one day to be a clothing swap day for parents. The parents donate any clothes their children have outgrown. On the set day, parents can come in and take other items for their children. Assign two parents to coordinate this! Go to the MAIN THEMES Page for More Theme Idea!